The Latitude D620 redefines the mainstream corporate notebook with an innovative new wide-screen design, excellent reliability, smart security & extended wireless options. The D620 facilitates increased productivity across the enterprise with the latest technologies available in a reliable but secure platform. 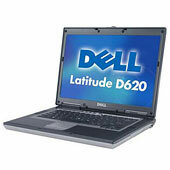 The Latitude D620 is designed for users who require performance, mobility and convenience in the work place. The Latitude D620 meets the customer need for a durable notebook with an ideal blend of the latest technology and mobility. Weight/Dimensions: Approximately 5.0 lbs / 1.26" x 13.3" x 9.3"